On 30 March the IGNS reported that a moderate-sized hydrothermal explosion occurred in the Alum Lakes area, Wairakei, knocking over trees and destroying vegetation near the crater. Water levels at several of the Alum Lakes had dropped several weeks before the explosion. The Global Volcanism Program has no Bulletin Reports available for Maroa. The 16 x 25 km Maroa caldera formed sometime after 230 thousand years ago (ka) in the NE corner of the 30 x 40 km Whakamaru caldera, which is the largest of the Taupo Volcanic Zone. The Whakamaru caldera partially overlaps with the Taupo caldera on the south and was formed during the eruption of the Whakamaru Group ignimbrites between about 340 and 330 ka. The Maroa caldera was subsequently filled by at least 70 rhyolitic lava domes or flows, mostly erupted along a SW-NE trend. Lesser amounts of basalt were also erupted. The latest dated magmatic eruption took place about 14 ka, when the rhyolitic Puketarata tuff ring and lava domes were formed (Brooker et al., 1993). The Orakeikorako, Ngatamariki, Rotokaua, and Wairakei hydrothermal areas are located within or adjacent to the Whakamaru caldera. 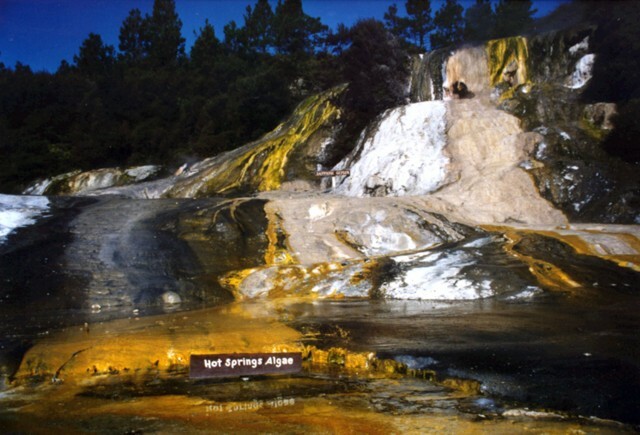 Large hydrothermal eruptions have occurred at the Orakeikorako thermal area during the Holocene, the latest immediately prior to the 1800-year-old Taupo eruption. Allis R G, 1984. The 9 April 1983 steam eruption at Craters of the Moon thermal area, Wairakei. New Zeal Dept Sci Ind Res Rpt, 196: 1-25. Brooker M R, Houghton B F, Wilson C J N, Gamble J A, 1993. Pyroclastic phases of a rhyolitic dome-building eruption: Puketarata tuff ring, Taupo volcanic zone, New Zealand. Bull Volcanol, 55: 395-406. Brown S J A, Wilson C J N, Cole J W, Wooden J, 1998. The Whakamaru Group ignimbrites, Taupo Volcanic Zone, New Zealand: evidence for reverse tapping of a zoned silicic magmatic system. J. Volcanol. Geotherm. Res., 84: 1-37. Kissling W M, Weir G J, 2005. The spatial distribution of the geothermal fields in the Taupo volcanic zone, New Zealand. J. Volcanol. Geotherm. Res., 145: 136-150. Wilson C J N, Houghton B F, Lloyd E F, 1986. 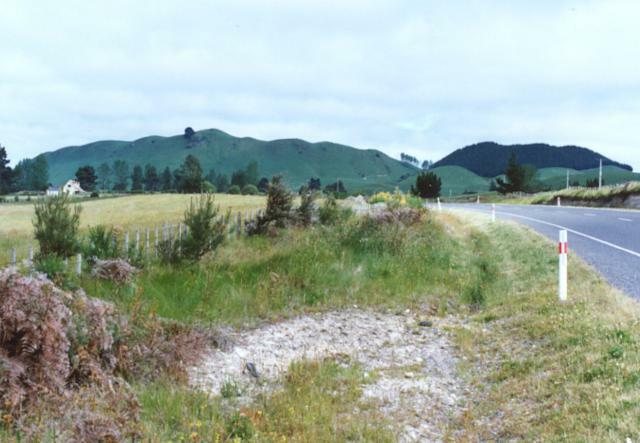 Volcanic history and evolution of Maroa-Taupo area, central North Island. Roy Soc New Zeal Bull, 23: 194-223. There is no Deformation History data available for Maroa. There is no Emissions History data available for Maroa. Ngahigo lava dome is one of at least 70 post-caldera lava domes erupted within the Maroa caldera, which formed sometime after about 230,000 years ago north of the Taupo caldera. The youngest of the post-caldera lava domes is Puketarata, which was emplaced within a rhyolitic tuff ring about 14,000 years ago. The domes were erupted along a general SW-NE trend, parallel to the structural trend of the Taupo volcanic zone. No Holocene eruptions have occurred, but vigorous thermal activity continues. Spectacular siliceous sinter terraces at Orakeikorako cover an area of about 1 cu km, forming one of New Zealand's most impressive thermal areas. 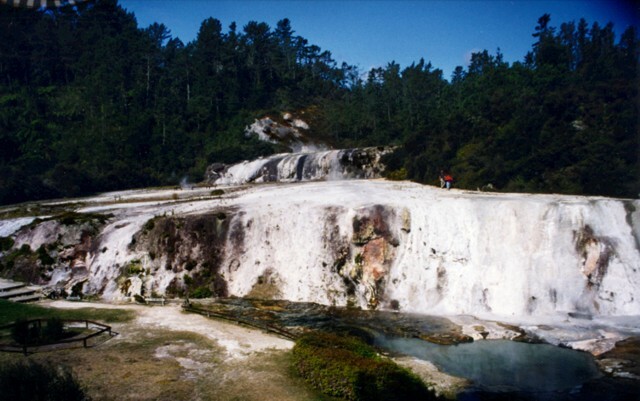 The thermal area lies along the Waikato River at an altitude of 260-360 m on the eastern side of the Maroa volcanic center. Hydrothermal explosions took place at five centers at Orakeikorako prior to the Taupo pumice eruption about 1800 years ago, depositing explosion breccias that immediately underlie the Taupo Pumice. Photo by Richard Wysoczanski, 1994 (Smithsonian Institution). Algae colors the surface of spectacular siliceous sinter terraces at the Orakeikorako thermal area. This geothermal area is one of the principal hydrothermal fields of the Taupo volcanic zone. It lies on the banks of the Waikato River where the Paeroa Fault divides into smaller branches that intersect the eastern margin of the Maroa volcanic center. Orakeikorako contains sinter sheets covering an area of about 1 cu km. Flooding of the river hydroelectric power generation has drowned about 70% of the hot springs. Large Eruptions of Maroa Information about large Quaternary eruptions (VEI >= 4) is cataloged in the Large Magnitude Explosive Volcanic Eruptions (LaMEVE) database of the Volcano Global Risk Identification and Analysis Project (VOGRIPA).